Can an enhanced garage door solve the garage problem? Here I will look at a couple of contemporary garage doors that make a valiant attempt to do just that. My complaint has been that in too many places the garage is more visible than the house itself. While it is appropriate for the house to dominate our attention, part of the problem is that the garage is so utilitarian. Its prominence is out of sync with its role. It is like putting the toilet on the front porch. It doesn’t matter if it is plumbed correctly, it just is not right. But what if the garage didn’t look industrial? What if it had the social graces of a front entryway? Can we tame this beast by dressing it up and putting a tie on it? That is what some companies are trying to do. On the surface it appears to be the path of least resistance. We have been prettifying the garage door at least since the demise of the alley. Stamped panels provide some texture and form and break it up into smaller units. Coats of paint blend it in with the house. Windows break up its monolithic shape. 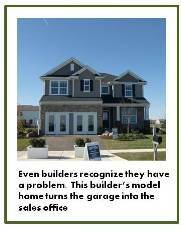 These have all been tried and are readily evident in our subdivisions. I will leave it up to the reader to decide if anybody is making a break through. I will go so far as to admit that a pretty garage door is at least better than an ugly one. I also think that this idea has more merit with modernist houses. It is difficult to justify a dominant garage with a Georgian house, or Victorian, or any other style that has deep roots in the past. 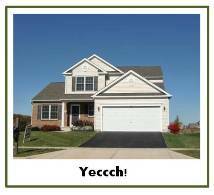 We have expectations, and a three-car garage is not among them. Modernist houses have long been in the business of smashing icons. It presents a world turned topsy-turvy. 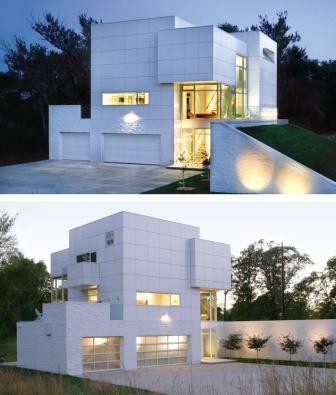 In such a world an eye-catching garage, with some living quarters tacked onto the back, does not seem out of place. 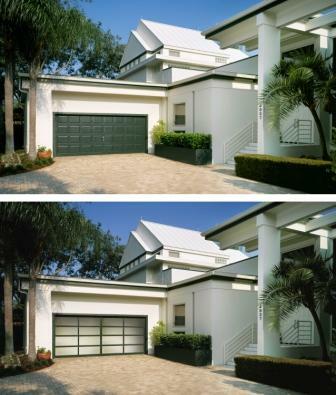 Some contemporary garage doors are making garages a worthy focal point for the house. Consider this series of translucent doors. In the first picture we have what appears to be a traditional house, but stylized with modern equivalents of the traditional columns and pediments. A contrasting black line at the top of the cornice carries across much of the house. It is these hard, angular, modern stylings that the new contemporary garage door successfully augments and advances. The second picture below is less successful. The original doors do a decent job of complementing the grid-pattern on the wall. The problem here is not the doors so much as the cutout for the doors. The house is not dominated by the garage. The monolithic form of the house resting on a driveway as wide as the house gives the illusion that the house itself is a garage. If anything, the cutouts for the garage doors seem to undermine the house. The solution, doors that provide a gentle contrast to the house during the day but advance the lighting scheme at night, does make an admirable improvement. Unfortunately the concrete pad still dominates and distorts our view of the house. Placed in a city context the concrete would not be noticed and the house might seem more appropriate. As it is…well… beautiful contemporary garage doors can only do so much. 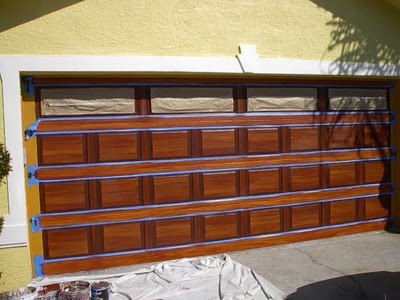 I just found a great site that will help you get that wood garage door on a budget. Below is a door that is in the middle of an upgrade. The owner is painting a metal door to look like a wooden door, and doing a great job. Does this sound like cheating? There is a reasonably good chance that your kitchen cabinets have the wood grain painted on. I was working with the owner of a factory that made high-grade cabinets and all of their wood had the grain painted onto the wood.